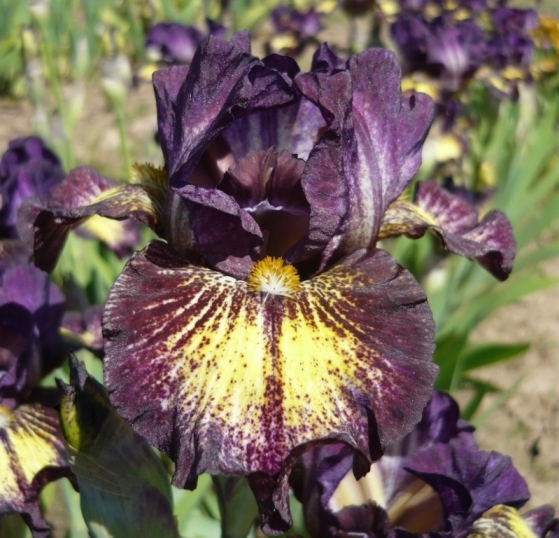 'Tomfoolery' (Keith Keppel, R. 2011) Seedling #05-10J. IB, 23" (58 cm), Midseason bloom. Standards huckleberry (M&P 47-J-11), slight warm-white center ground; style arms light burgundy (56-H-5) crests; falls sunflower (9-L-3/4) ground, 1/4" dark reddish purple (48-L-11) plicata edge; beards white, tipped yellow ochre (11-L-7). 'Overcast' x 'Snow Lion'. Keppel 2012.